Ever wondered what a week without the subway looks like? Today, Friday August 10, marks day seven of the longest subway strike in Argentina’s history. The complete shutdown of the Subte, Buenos Aires’s underground transit system, began Friday night and as I write, the end is still not in sight. My midday trip across the city – had to watch 3 packed buses pass me before wedging my way onto this one. 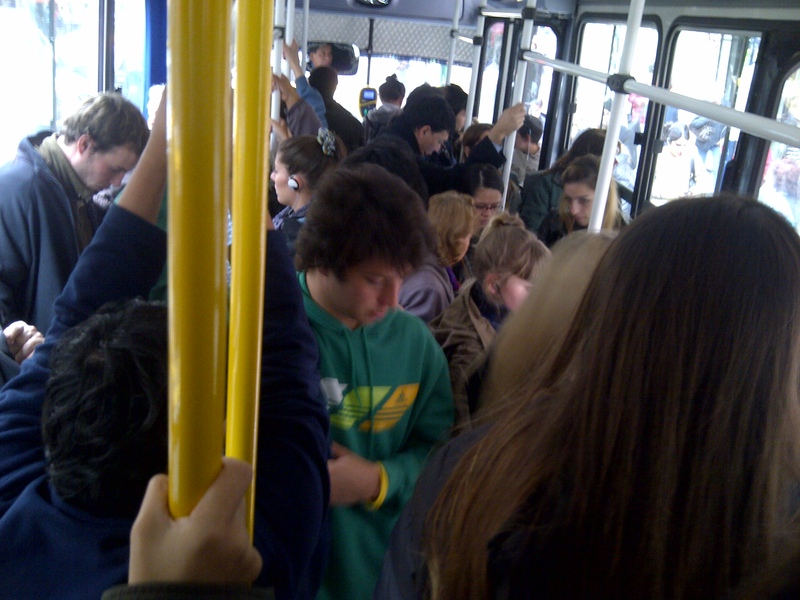 A seven day subways strike in Buenos Aires is paralyzing. The Subte workers union AGTSyP called the strike to demand a 28 percent wage increase. The complication exists when asking who is responsible to meet or negotiate these demands with the union. Metrovias is the privately owned company that manages the Subte; however, the system is highly subsidized. In 2010, Argentina’s planning minister estimated these subsidies to be equal to 706 million pesos. Although I constantly poke fun at the fact that the peso is bleeding value at a rapid rate, that’s quite a cost. So substantial in fact that in November, the national government announced plans to hand the administration of the Subte system to the city government of Mauricio Macri. Now I could wax poetic on this topic, but for the purposes of this post it serves to understand that President Cristina Kirchner and Mayor Mauricio Macri do NOT get along. At all. As in, seat them on different sides of the room and write about their run-ins in the tabloids. While Kirchner and the National Government insist that the city must be responsible for the Subte, which exists within the city, Macri has responded that his administration will not take control until significant necessary investment is made. He has asked that the national authorities allow him to seek international financing, and quipped that in order to finance the project, he would have to close kindergartens. The labor union blames first Metrovias for not using subsidy money appropriately, then the City, and finally the national government. The result of this circle of blame is millions of people a day spending an extra 2+ hours getting to and from work, which I will tell you firsthand is a truly ugly picture. A “counterstrike” has been organized via Twitter and Facebook by the users of the Subte, who claim they are the only ones paying for the power dispute between city and national government. The community is calling for people to jump the turnstiles and take back their lost week from Monday to Friday. But while the Subway cost and the wage increases are indeed a steep bill, who is really paying the bill? Buenos Aires has a labor force of 4,656,000 – the majority of whom are affected by effective shutdown of transportation in the city. If we take 3.5 million to be conservative and account for people in the provinces who do not commute into the city, it’s still a substantial number. As a rough estimate, if the closed Subte and gridlocked streets add an average of two hours to each daily commute, this strike has cost the City of Buenos Aires 35 million hours in lost productivity just from Monday to Friday. It doesn’t take a labor economist to tell you that 35 million lost hours is not good for the productivity of any city. And you only have to have spent a few hours of your life stuck in traffic to understand how universally pissed off it can make people. At this point, the strike has gone on for seven days – and everyone involved is losing. The question remains how much longer will this go, and how big of losers will we be? 1 Response to Ever wondered what a week without the subway looks like? Great blog Post! I like this post because it analyzes the underlying cultural problems that I believe are a major factor in Argentina’s continuing high inflation. As I said in my comment to your last post, the Cristina Kirchner government does not want to use its political capital to confront the labor unions. And in this case, what they did was force Macri (the Buenos Aires Mayor) to take control of the subway, even though he has been constantly trying to push it away. It’s like the game hot potato; whoever holds the hot potato when it explodes loses the game, and this is what Cristina did to Macri. Macri, a right wing mayor, also is a perfect example of what happens when Argentine politicians try to have a facedown with Argentina labor unions. When he refused their demand of a 28% wage increase, he pays a huge political price. The city subway system loses money, the labor unions get even more aggressive, and the people get angry. And its been 8 DAYS!!!!! In contrast to the United States where some may argue labor unions have too little control, Argentina is the opposite; labor unions have too much control. This is why I believe the fundamental problem with Argentina is its culture, not its economy. It is the culture of the eternal protest. It is a no win situation for a politician. 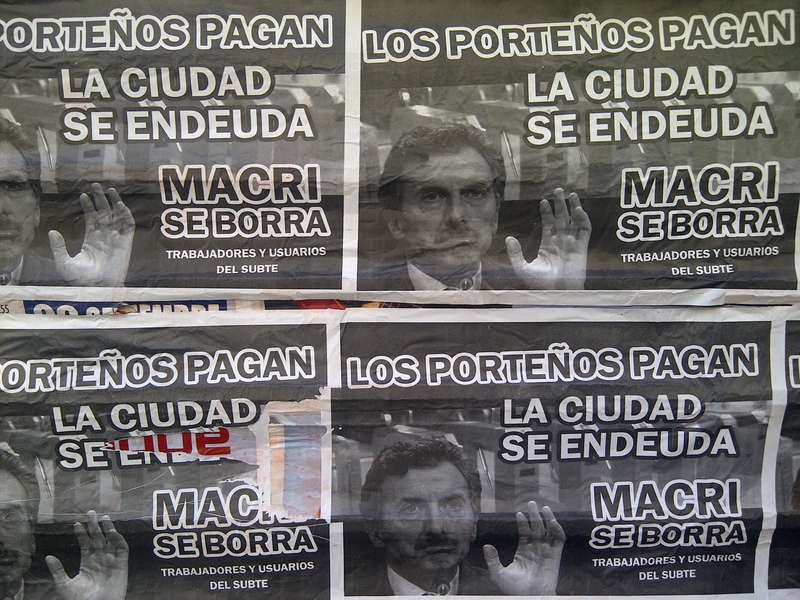 This displays why Kirchner wants to minimize as much possible its exposure to labor unions. Now that the inflation cat is out of the bag, it’s impossible to deal with these labour unions, even when the courts of justice demands them to go back to work. My question to you or any of your readers is: how do you solve such a difficult situation? Is it possible to force a major decrease in expected inflation related wage demands without considerable harm to the commuters and subway? And how do you minimize the power of the labour unions? I know this isn’t an economic related question, but I believe this political dilemma is very much connected to the economy and is a big contributor to Argentina’s high inflation rate.